This site was created by Hivebrain in the middle of 2003. 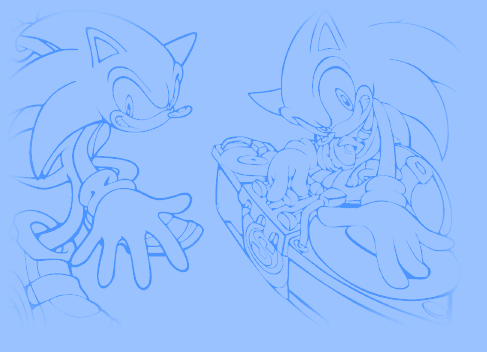 He, like me, noticed that the only sources of Sonic-related artworks in good quality were on SEGA FTPs (usual video games websites offer bad-quality GIFs or JPEGs most of the time). But they are provided for professionals or graphic designers only, and are ways too large and too long to download for just a "less professional" need. Add to that the limited 21 KB/s bandwidth those FTPs intentionally offer (this is really slow, mainly on a broadband connection) to discourage "ordinary" people to download them. These are not optimal conditions to download artworks, just to use them on a personal composition or Sonic-related item, or simply have them in full quality. And we usually don't absolutely need full resolution to use them. Also, he didn't want to offer a simple artwork gallery we could only passively watch. But instead, offering artworks one could do something decent with. It's in that order of idea that he decided to open this site which the ambition was to offer full quality PNG versions of our beloved and well-known artworks. About PNG, despite its qualities (lossless compression, Truecolor possibility and transparency on an alpha channel), this image format is still fighting to get some popularity on the web. Such a website initiative had never been done before, and with the growth of broadband connections, became more than welcome. That's why SAA or SoAA was born. Since its creation, it helped and assisted a lot of people, including me (lol, to create my odd wallpapers^^ ) and still do. So I keep on thanking Hivebrain for such a brilliant idea, even if at that time, I was doing nearly the same thing. But, I didn't have the idea to create a website (instead, I was just planning to make a topic on the Sonic-CuLT forum but, I quickly saw that I found better ^^). In the middle of 2003, on my side, I decided to gather all artworks I could find on the web, restoring their original quality by cleaning them in very smart and unique way and accessorily adding an alpha-transparency to them. All that to offer them in full quality in PNG format. At the beginning, I was just showing them on the French forum I usually go to. But, as the same moment, on the Sonic-CuLT forum, Hivebrain (already maintener of the excellent Sonicology and the Sonic Box Art Archive), had a similar idea, but instead was offering them on website, hosted by his college. Of course, I was completely delighted by such an initiative and began to give "my" first cleaned and optimized versions of the artworks I had. Unfortunately, only limited webspace was offered and the website quickly filled too much and "was eating too much bandwidth". This forced Hivebrain to close his site. This indeed affected me but didn't make me stop my activities. That's why I naturally asked Hivebrain to give me all the contents of the site so that I can move it to a better place and re-open it, thing he nicely accepted to do. This way now, the site lives again and never stops enlarging! At the base, the website had to be maintained by both of us. But, as I were the most active by far and because of Hivebrain's college firewalls which prevented him to have FTP accesses, I virtually became the only maintainer. Hivebrain finally prefered contributing to the archive instead, probably in order to take the time to do other activities (I'm feeling that my text is going a bit too far, just point me out, Hivebrain, if I'm writing things that you consider wrong or weird!!!). OK, I've just finished now for the history, I just hope I wasn't too annoying :p.
Hivebrain (Sonic fan, really active on the Sonic scene, as much artistically as in the emulation scene, author of nice Genesis Sonic hacks, and maintaner of quality Sonic sites, like Sonicology or the Sonic box art archive). He created and maintained this site in its early days. He's also famous for his brilliant Sonic games logo re-creations (take this Sonic Art Archive logo as an example^^ ). Dioxaz (the stupid guy who is typing this text -- yes, I'm really tough with myself :(( -- also a Sonic fan, not that active on the Sonic scene but made some -- completely out-of-date -- hacking discoveries into Sonic Advance, designed lots of cool Sonic-related wallpapers in PNG format, composed a few cool musics in XM format and maintainer of The Leaf Forest Zone and the Sonic Discovery Resource, his two main sites). He's currently doing his best to keep the site alive by performing his usual optimization operations on all the artworks he finds and also by trying to make the site look more attractive than ever :p. He's also the current maintainer and editor of this site. You can help us maintaining the archive by offering your help. If you've got some rare artworks you consider they should deserve a place here, don't hesitate to mail to one of these address: dioxaz @ libertysurf.fr (for my address) or leonwhite1 @ gmail.com (Hivebrain's one, don't forget to remove the spaces if you want to mail us, this was just a precaution I used to limit spam or abusive mailing ^^ !). As I'm the most active, you should mail to my address preferently, but if you feel that my mailbox is full, that there is a problem, that I'm absent or not responding during a long period (it can happen, as I tend to really lazy sometimes), you can try Hivebrain's one. He'll normally mail me back the artworks when he's got the time. Anyway, a good solution to prevent one's mailbox to be full is to host artworks on one of your personal web accounts/sites if you've got one, and then link to them into your message. You may send/provide them as full quality PNGs, even if they are scans and seem huge, this is highly preferable, and will make cleaning easier (because, no compression or irreversible color subsampling artifacts :p). You may also want to clean them yourself if you feel able to do that, this is even more welcome (espacially scans, because the "color-printing" pattern of magazine scans is really hard to remove :p). So, if you've got rare artworks, if they are in acceptable quality (if you send me images found on the web, or that you don't know the source, you can let them in JPEG if they were already like this, you don't need to convert them to PNG, except if you plan to clean yourself of course), if they are well kept (no scratching or holes on the paper, if they are scans), if I already haven't got the same artwork or if it's in higher resolution, just don't hesitate. People like Rlan, Rika_chou, Ben2k9 and Adamis already did it, so why don't you? You'll notice that despite the use of PNG, the images are relatively compact in file size (I also used PNGOut to acheive the best compression I could, without harming quality). However, If you feel they still are too huge to you, you might feel the need to convert to banner to JPEG and the button to GIF. If you do so, please don't select a too low quality setting. To give an order of idea, I had to select a quality setting of 70 for the banner, under Image Ready 7 to reach a similar file size. So in my opinion, and considering the nature of the image, converting the banner to JPEG (and/or the button to GIF) is not a good idea (for the button, you cannot get a smaller file size by using GIF format, without losing something in quality by reducing the color-depth^^).